This Icelandic secret will help you hit the refresh button on your skin! I love bringing the beauty of my garden indoors. If you don't have a garden, don't stress - dried floral buds and petals are readily available! My all-time favourites? Rose, lavender, sage, basil and parsley. I also like lemon balm - it reminds me of my childhood patio. 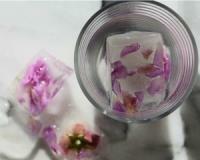 Tassels of bright pink flowers, blue sea lavender, clary and argyranthemums - the floral equivalent of your grandmother - are begging you to put them gently into ice cube trays. That's right - the Icelandic believe that with all these blossoms, you can refresh and rejuvenate your skin! Just think about the possibilities that foraging could take you. Like lip stains made from beets and cherries, rinses from chamomile and nettles, or blush from marigolds, herb and floral ice cubes are a fun and fabulous way to quite literally infuse your beauty ritual with a truly unique and potent touch! Icelandic people believe that by using herbs and flowers in ice cubes, you can tighten your skin, reduce skin inflammation as well as brighten your complexion. In fact, herbalist Anna Rosa Robertsdottir’s encyclopaedic tome, Icelandic Herbs and Their Medicinal Uses, is a comprehensive and absolutely excellent anthology about the medicine powers of 90 herbs in Iceland. In a small bowl, combine all of the ingredients. Stir gently, then pour the liquid into your ice tray. Top each on with your herb or flower of choice before you place your tray in the freezer. Now it’s time to patiently wait until your DIY beauty concoction is solid! Once your ice cubes are frozen and you’re ready to use them, pop the ice cubes out and roll one all over your face and neck. Pay attention to your eye area and the sides of your nose. Finish with a spritz of rosewater. You’ll smell so great and look so dewy afterwards that people will want to know your secret. This time, you should totally tell them!